The mantra of the day was “any blue just won’t do” and the event, which boasted speakers like Sens. Bernie Sanders, I-Vermont, and Elizabeth Warren, D-Massachusetts, said the path for Democratic victory in conservative districts is to embrace progressive values and positions, not hide from them. Arizona lawmakers and advocates are condemning proposed fee increases at the Grand Canyon and 16 other parks, a move the National Park Service said is badly needed to fund billions of dollars in backlogged maintenance projects. The Resolution Copper Mine in Arizona would be operating by now in most countries, but is still years away from getting all the permits it needs to begin mining in the U.S., a company official testified. 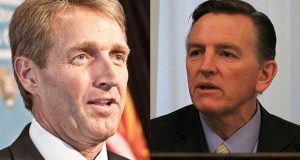 Paul Gosar’s flirtation with next year’s U.S. Senate race turned out to be short-lived.